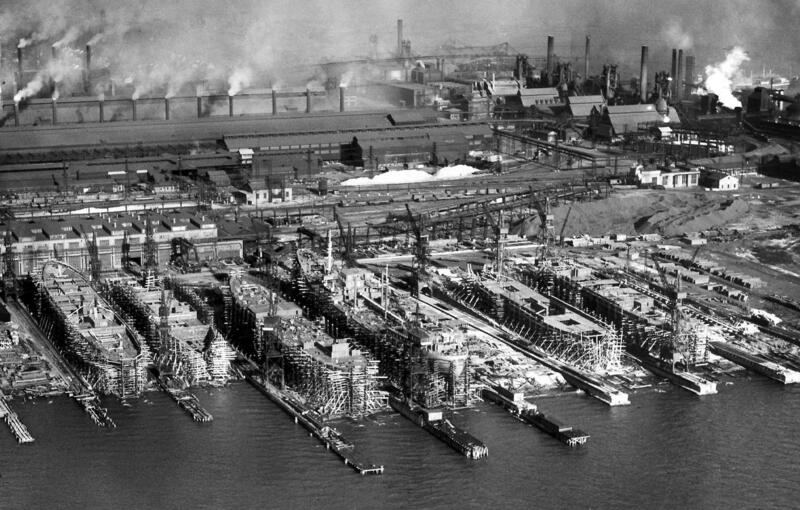 The Bethlehem Steel Sparrows Point shipbuilding piers, with the steel mill in background, at full tilt in 1940. Today, we present an archive edition of Midday for the Labor Day holiday: Midday, WYPR and the Baltimore Museum of Industry team up for a special program -- presented as part of BMI's Issues in Industry series -- examining Baltimore's calamitous de-industrialization, the challenge of rebuilding the city's workforce, and the future of work in Baltimore's increasingly dynamic industrial landscape. Broadcast in front of a live audience at BMI's Communications Gallery, the hour-long discussion features guest panelists Anita Kassof, BMI’s executive director; Dr. Nicole King, associate professor and chair of the Department of American Studies at UMBC; Phillip J. Pack, a retired Sparrows Point steelworker and union trainer; Lauren Purviance, with Jane Addams Resource Corp., a Baltimore job training firm; Dr. Julianne Malveaux, a labor economist, author, media commentator and CEO of Economic Education, LLC; and Joe Jones, Director, Center for Urban Families, a Baltimore nonprofit. The panel also addresses audience questions and comments emailed and tweeted during the show.